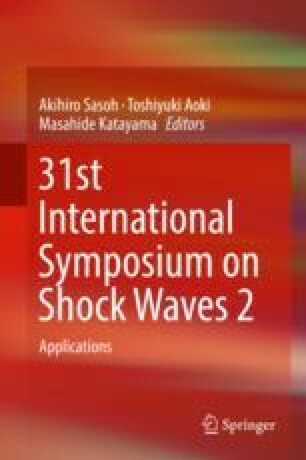 Abnormal pitch-up phenomenon of winged reentry vehicles at hypersonic gliding was experimentally studied in the high-enthalpy free-piston shock tunnel JAXA-HIEST. The novel multicomponent force measurement technique “Free-flight in wind tunnel” was implemented, which involved the test model being completely non-restrained for the duration of the test and thus experiencing free-flight conditions for a period on the order of milliseconds. The test model was a 10%-scaled HYFLEX Japanese lifting body reentry vehicle. Sixteen miniature piezoelectric accelerometers and eight piezo-resistive pressure transducers were instrumented in the model with three onboard miniature data recorders to store measured data. During the test campaign, the model angle of attack was varied from 30° to 50° with elevon (body flap) deflection angle of 0° and 20°. To derive the high-temperature real-gas effect, the comparison was conducted on the aerodynamic coefficients between perfect gas condition and the high-temperature real-gas condition. The following two test conditions were selected: (1) low-enthalpy test flow condition in which no oxygen molecules were dissociated and (2) high-enthalpy test flow condition in which 40% of oxygen molecules were dissociated. The comparison revealed that the lift-drag ratio agreed quite well in both of the above conditions. However, a significant difference of trim angle was detected at a flap deflection of 0°. The high-temperature real-gas effect was believed to be the major cause of the difference.